Do NOT charge 9 V batteries! 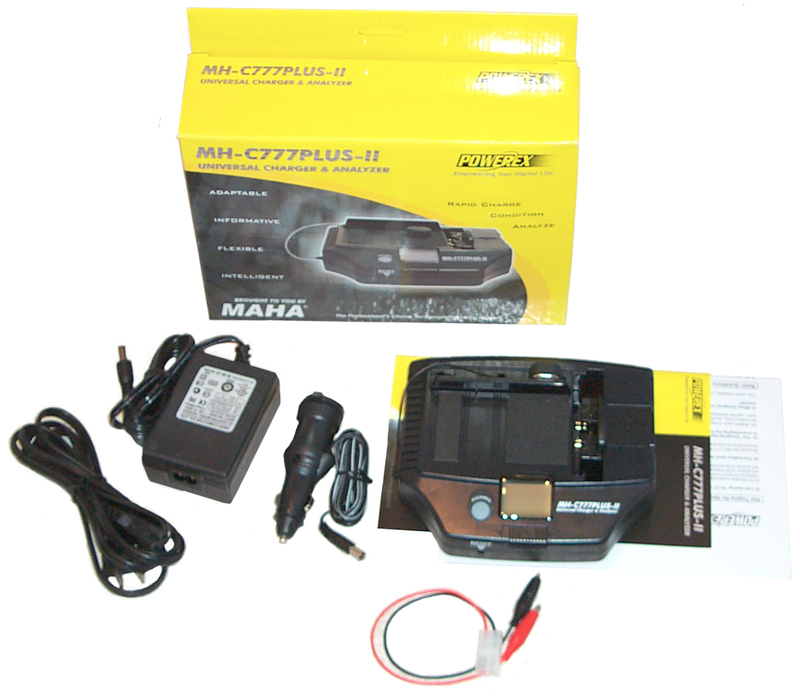 One of my early battery chargers was the C777Plus. It looks very similar to the Plus-II. The Plus-II has a recessed RESET button on the front panel that wasn't on the Plus and also behaves differently in how it works. The reason I got the C777 was that it could charge packs containing different numbers of cells. Most chargers are made to charge only one pack configuration. Another feature of the C777 chargers is that they can discharge. During both charge and discharge the LCD shows you the mAh put in or taken out of the battery pack. In the photo above the LCD is showing on the top line BATT MODE Ni (there's a switch on the left for Li or Ni chemistry), 05.8 V (the current battery voltage), 1465 mAh (the charge that's been put into the battery so far and on the bottom line QUICK CHARGE (CHARGE is blinking indicating it's still charging). In addition to the C777Plus-II unit there's a Cigarette Lighter DC power cord, a laptop type brick power supply with a seperate two prong AC line cord, a short length battery connection cable with red and black alligator clips, the manual and Supplemental Instructions & FAQ. On the left is the center positive 5.5x2.1 mm input power jack. Note the label above says 12 to 24 Volts and the icon shows center positive. When the AC brick power supply is used the input is 22 to 27 VDC at 1.1 Amp max. (24 VDC typ). But, when the cigarette lighter cord is used the input will be in the 10 to 15 Volt range, most likely around 13 or 14 Volts. To supply a constant current there needs to be some headroom above the fully charged battery voltage, so when you use the cigarette lighter cord the max Li voltage drops from 14.4 Volts to 7.2 Volts, and for Ni the max voltage drops from 14.4 to 4.8 Volts. Set the switch for Nickel or Lithium. After power up with no battery connected the LCD shows the input voltage. for the capacity - - - - it shows since there's no battery, and the bottom line shows QUCIK. If there's a problem this is the first thing to check. Just in front of the LCD is a polarity switch. In the photo it's shown to the right. Just after taking this photo A 6 Volt battery was connected and the display flashed ERR1 and the 777 was beeping. After looking up that error in the manual which said battery fault most likely reverse polarity. 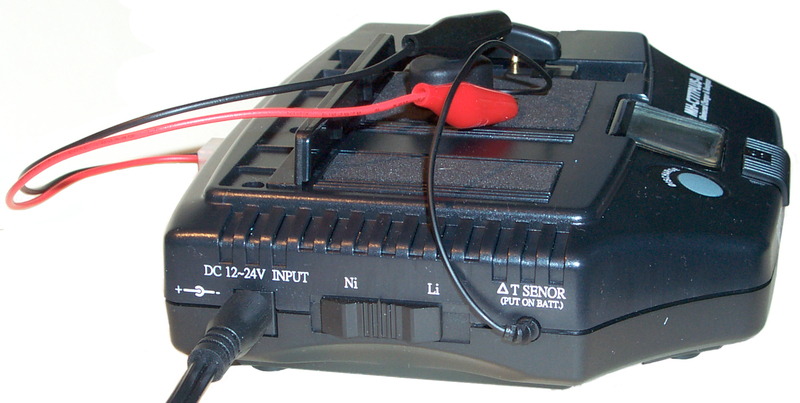 I use the alligator clips and only once tried to use the contraption on the top that's designed to charge battery packs that only have flat metal contact patches. It can be done but is a balancing act. If you use the alligator leads it's easy to connect red to + and black to - and so you'll forget there is a polarity switch and what ERR1 means. See the photo at the top of this page. The temp sensor MUST be connected to the pack. It has a magnet and all rechargeable batteries (with an extremely small number of exceptions) have enough ferrous metal to hold the sensor. I like to put it near the center of a pack and if possible so there are two batteries touching it. The idea is the have it sense the hottest part of the pack. Since this charger will work with battery packs made up of a number of cells it needs a way to know how many cells are in the pack. To do this it charges the pack for 3 minutes and at the end of that time makes a determination of how many cells are in the pack. This is an important step and was the problem I had with the C777Plus (no number). 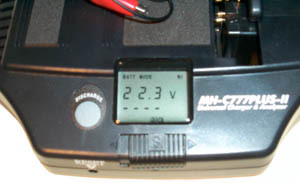 For example a Ni-MH (or Ni-Cad) pack will have between 1.2 and 1.4 volts per cell so a 4 cell pack should show between 4.8 and 5.6 Volts on the LCD. If after the 3 minute surface charge the meter is showing more than 1.4 V/cell there is a problem. If the voltage is less than 1.2 V/cell the battery may just be starting out very discharged. In that case you can remove it and start over, but in three minutes only a vary small amount of charge will be put in, so you may need to use another charger to get the voltage up. You can just let the C777 automatically go into Quick Charge mode. The charge current is controlled only by the Chemistry switch (800 ma for Ni and 400 ma for Li) so the number of cells is not a factor in the current. The charge will be terminated when any of a number of things happen, either the -dV/dt hits a trip point or there is a zero delta V or the max temperature is reached. (There may also be a peak voltage termination). This was a problem with the C777Plus and Ni-MH, it always terminated with Err3 High Temp, not warm but hot. If a battery has not been used for some months then it's a good idea to cycle it while paying attention to the mAh for both charge and discharge. You can keep cycling as long as you're getting more mAh. But once the mAh flatten out then that's as good as it's going to get. If the final number is way below the label capacity then the battery is no good. The -dV/dt charge determination value depends on the number of cells in the battery and the Peak Voltage charge termination depends on the number of cells.. When using Peak Voltage for termination the number of cells is a first order (major) factor. 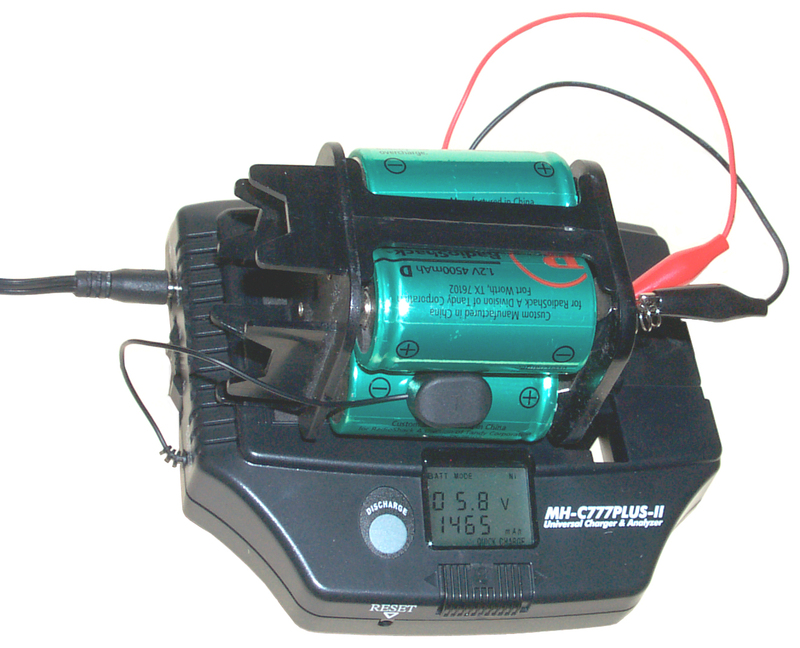 For example a 4 cell pack of Ni-MH cells would be fully charged when the peak voltage was about 5.6 with no charge or load and maybe a little higher, say 5.8 V while under charge. When trying to understand the problem charging 4 eneloop Ready-To-Use AA cells held in a 10 AA battery holder where the discharge was stopped too soon and where the charge was stopped too soon and the 777 first generation unit was showing a voltage that was higher than it should have been the effect of estimating the number of cells at 5 instead of 4 would be to over charge or over discharge. Maybe the problem was with resistance added by the battery holder? The charge current is 800 mA! Note three cells have poped open expanding the size of the pack and blowing off the top. The battery is warm but no hot and there's no error message. This is a big improvement over the first generation charger. These cells are rated 4500 mAh and had some charge in them so the display is about right. Note that you need to put in more mAh than the battery rating. The normal C/10 charge for 16 hours puts in 60% more than the rating. So in terms of efficiency batteries are not that good. To discharge just press the Discharge button, but it's good to wait for the battery to reach room temperature first if it's hot. The Full icon turns off and in the lower left of the LCD DISCHG is blinking. Discharge is about 300 ma for either battery chemistry so if these cells are near 4500 mAh it will take 15 hours or 7 am tomorrow. I just pressed Discharge until the C777Plus-II started the discharge and DISCHG was blinking. 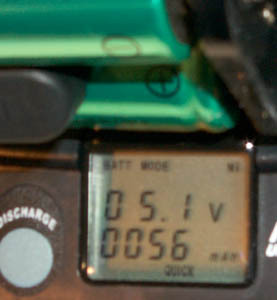 This is the Discharge then Charge mode which was the only mode in the first generation unit. So this morning the LCD is showing QUICK CHARGE and CHARGE is blinking. So I missed the discharge capacity. This is new with the C777Plus-II. 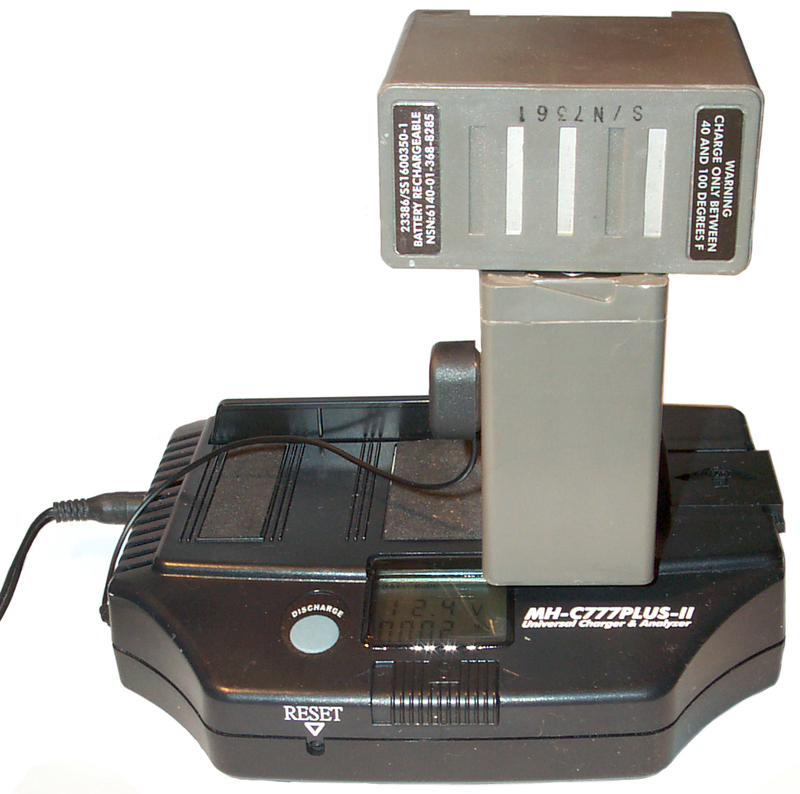 To enter Analyze you must PRESS AND HOLD down DISCHARGE until the display stops blinking, about 3 or 4 seconds. You can recognize an analyze discharge since the DISCHG icon will NOT be blinking. When the analyze function gets to end of charge the LCD just stays in a state showing the capacity and time and does NOT automatically start charging the battery. The LCD will continue to display the capacity even after the battery has been removed. This is a good thing because you may remove the battery then realize that you haven't recorded the data. To clear the LCD and start another charge or discharge you need to press the RESET button on the front panel using a small screw driver or other tool. It's a good idea to recharge a battery after it's been analyzed. It's not a good idea to put a discharged battery on the shelf. 14 Dec 2007 Noon - the charger beeped at the end of a charge with a dispaly of: 5.7 volts, 476 min , 6,900 mAh. Pressing and holding Discharge for a few seconds resulted in a discharge icon on the LCD that was not blinking and the voltage changed to 5.5 Volts. Observation: 476 minutes is close to 8 hours which would be 4 am instead of the 7 am I had estimated. That's short by 3 hours which times 300 ma is 900 mAh. So the capacity was about 4500 - 900 = 3,600 mAh. 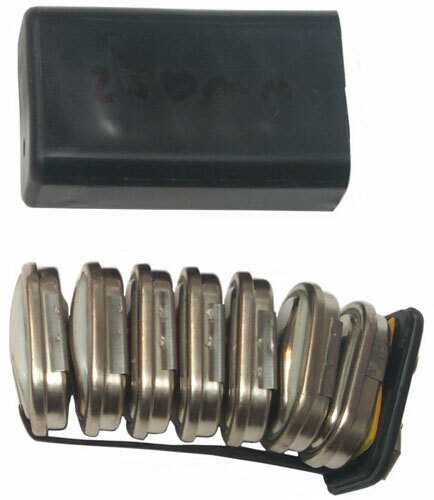 Observation: the change in voltage is because of the total resistance in the circuit which includes the short wires and alligator clips, contact resistances at all the contacts, the resistance of the battery holder and the internal resistance of the cells. So: (5.7 V- 5.5 V) = R * (300 ma + 70 ma) or R is 0.54 Ohms. 300 ma because that's the charging current and 70 ma because that's the trickle charge current that's applied after a charge has ended. The two currents are added because they have opposite polarity. If you were watching the voltage when a charge ended the voltage should drop because the charge current changes from 800 ma to 70 ma. DISCHG is on solid and QUICK is blinking. Why the zero space then 4.5 Volts? 759 minutes is 12.65 hours * .3 amps = 3.8 Ah, yet the 777 says 4.377 AH, why? Also the analyze was started at 12:20 and exactly 12 hours later it beeped. 12 hrs * .3 amps = 3.6 AH. 12:30 pressed reset, removed a clip lead to clear error, reset again and it's not on quick charge. It may be that the 777P2 is using some kind of pulse during charge, discharge or both and it that's the case the duty cycle would effect a clock time analysis. [an error occurred while processing this directive] page created Dec 13, 2007.